Freedom Ranger meat chickens came on the scene 2-3 years ago as the chicken for raising on pasture. If anything, it was clever marketing by the hatchery who sold them. That hatchery closed its doors last spring but people are still looking for Freedom Rangers and have sent me a few e-mails because I had the chance to raise them last year. My opinion on them? They are nice birds. Mortality rate for them was high this year but this was right after shipping and everyone had troubles. As far as the adult birds go, my customers loved them. They dressed out from 5.5-6.5 pounds after 3.5-4 months. The disposition is sweet and despite their large adult size, they are fast on their feet, like to wander and are great foragers. In fact I kept 6 hens because of their personalities. 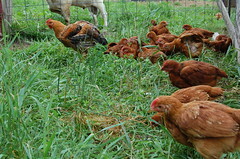 There are other kinds of chickens that are very well suited to grass. Last year I also raised K22 broilers from Moyer’s. They had the same growth rate and dress weight as the Freedom Rangers. My customers loved them too. I ordered only roosters and ended up keeping one – he escaped the last day I was bringing everyone to the butcher. So I can say with great authority that they are agile runners and also they winter well! 717-330-3247 FAX 717-354-0728 — French Guinea Hen Keets, Bantam Silkie Chicks, Khaki Campbell Ducklings, Muscovy Ducklings, and Hubbard Colored Free Range Broiler Chicks (Red Bro, with others to come soon). e 15490 Burr Salem Rd. I am still deciding what I will raise this year. Hopefully this information will help you in your decision! Posted in Poultry. Tagged with apppa, broilers, chickens, freedom rangers. 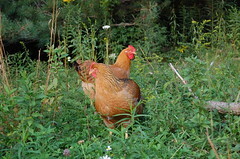 Are you planning to breed the hen and rooster you saved from your batch of red broilers? Will they produce they same type of offspring? I have been very curious about this for some time as i would really like to raise my own chicks (I’m on the west coast and transportation from PA almost never turns out good). It’s possible they could breed, but as hybrids, their offspring wouldn’t be the same. I have noticed the hens are a little delicate. It may be that they are so wide, rooster claws hold on to tender areas more than other breeds. The hens get a bit torn up and I am always tending to them. 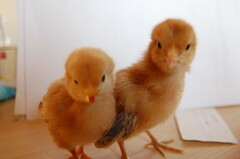 We sell Freedom Ranger chicks by mail order and yes, they do very well in a free range setting. Plus, they taste amazing! They are an excellent alternative to the Cornish cross. 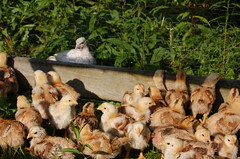 https://www.mailorderpoultry.com/freedom-ranger-broiler-chicks/. Just to let your readers know, we ship these every Wednesday all year long. Minimum order of 15 during warm weather and minimum of 25 during cold.